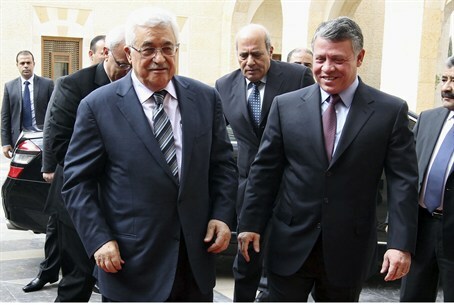 Jordan’s King Abdullah II says Israel is responsible for the deadlock in peace negotiations with the PA.
Jordan’s King Abdullah II on Tuesday blamed Israel for the deadlocked Middle East peace process, the official Petra news agency reported. According to the report, the king made the remarks during a meeting with representatives of the New York-based Conference of Presidents of Major Jewish American Organizations. The organization’s Annual Leadership Mission was held in Jerusalem this week. Petra reported that King Abdullah was specifically concerned over Israel's “unilateral policies”, including changing the identity of the Arab sector in east Jerusalem and tampering with Muslim holy shrines there. Speaking after the meeting with the king, Malcolm Hoenlein, the executive vice chairman of the Conference of Presidents, acknowledged the king's concerns but said he had also been complimentary of Prime Minister Binyamin Netanyahu's peace efforts and had asked Hoenlein to convey a message of thanks for Israel's proposals in the latest round of peace talks. Jordan recently hosted Palestinian Authority and Israeli representatives for a series of “exploratory” talks, which ended after the PA refused to continue them. “[The king] praised Netanyahu and asked that we specifically give a message to 'my friend' that I appreciate his taking risks by putting forth the package that he did ... a package that he knew was difficult to do, but he created a climate to enable the process to move forward and for negotiations to take place,” Hoenlein was quoted by AP as having said. The details of the exact “package” offered by Netanyahu were not revealed, but a recent unconfirmed report said that Netanyahu plans to announce a plan to uproot communities and carry out mass evictions in Judea and Samaria. The report said that due to the political impasse between Israel and the PA, Netanyahu is expected to propose a final status solution that would leave Israel with only the major settlement blocs and eastern Jerusalem.